Semifinale a senso unico, dominata dalla fisicità delle nigeriane che schiantano per 6-2 la selezione coreana. Semifinale 3-4 posto contro la Germania. Asisat Oshoala scored four times as Nigeria reached the final with a thumping 6-2 victory over Korea DPR in the highest-scoring semi-final ever seen at the FIFA U-20 Women’s World Cup. Oshoala also laid on two more goals in a win that leaves the Super Falconets to face either France or Germany on Sunday at Montreal’s Olympic Stadium, and the North Koreans to play for third place at the same venue. In similar fashion to her appearance and goal in the quarter-finals against New Zealand, Uchechi Sunday came on as a substitute and within a minute scored to restore her team’s two-goal lead. Oshoala then put the game out of reach on the hour mark when she hit a stunning shot from 20 yards out that left Kim with no chance as it flew into the top corner. Oshoala had taken the wind out of the Korean sails far earlier in the match and when the final whistle sounded, her Nigerian team-mates surrounded her in celebration, while Hwang Yong-Bong’s side trudged off disconsolately. Posted in Senza categoria and tagged nazionale femminile under 20 on agosto 21, 2014 by calciocorea. There are no statistics to prove it, but footballing folklore holds that players who take the term ‘run-up’ literally and sprint up to the ball in a penalty shoot-out are nervous and therefore less likely to score. All four USA takers against Korea DPR trotted up and three went on to miss. This time round, however, there should be no talk of curses or bottling it. 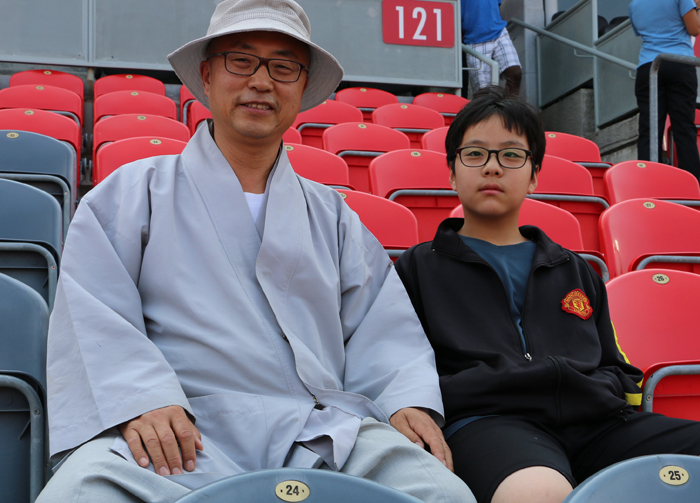 Simply put, the talent of Korea DPR goalkeeper Kim Chol-Ok made the difference. 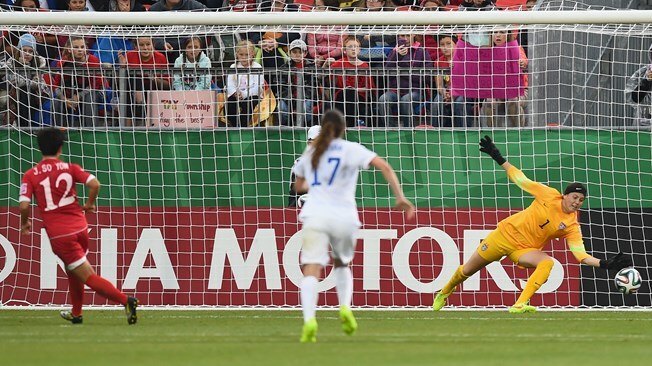 Savannah Jordan, Lindsey Horan and Rose Lavelle all hit the target from 12 yards, but Kim stood tall and came into her own to dump the holders out at the quarter-final stage of the FIFA U-20 Women’s World Cup Canada 2014 and send the 2006 champions into the last four. When the scores finished level after 120 minutes, the shot-stopper was far from nervous. While the takers on both sides will have had butterflies in their stomachs as they approached the spot, Kim was in her element. In the first shoot-out of her international career, the April 25 SC custodian produced a masterclass and seized the Player of the Match accolade with both hands in the process. As she spoke to us after the game, she had the framed certificate tucked firmly under her arm and each and every one of her team-mates came over to congratulate her, flashing her a smile or cracking a joke en route to the team bus. All were eager to sneak a peek at the award, which Kim plans to use as personal inspiration in the future: “I’m going to treasure it and give it pride of place on the wall at home so that every time I look at it, all the great memories will come flooding back,” enthused the 19-year-old, clutching it even tighter. Speaking of inspiration, the youngster’s knowledge of the goalkeeping greats is clearly as wide as her reach between the sticks. Asked about her idol, she batted away the names of Iker Casillas, Gianluigi Buffon, Manuel Neuer and Hope Solo. “I’ve always admired Lev Yashin,” she revealed, despite the former Soviet Union legend having retired over 40 years ago and died four years before she was born. The Moscow-born icon would certainly have identified with the North Korean’s match-winning performance against USA. Yashin is believed to have stopped over 150 penalties over the course of his career, while in a single game Kim can now add three to her own personal tally. Posted in Senza categoria and tagged nazionale femminile under 20 on agosto 18, 2014 by calciocorea. E’ Kim Chol Ok l’eroina della giornata. Il portiere della nazionale femminile under-20 para i primi tre rigori contro gli Stati Uniti e porta le sue compagne in semifinale. Partita subito in salita per le ragazze di Pyongyang che appena dopo 6 minuti subiscono il gol americano, con Mackenzy Doniak. Ma la reazione è importante e le americane vengono schiacciate nella loro metacampo per tutti i successivi minuti di gioco, fino a quando al 18esimo della ripresa Jon Ryon-Hwa segna un calcio di rigore causato da un fallo di mano. Le coreane spingono ancora e creano numerose palle gol non sfruttate. Nei supplementari è la stanchezza a farla da padrona, dall’una e dall’altra parte, mentre ai rigori le americane calciano malissimo tre rigori su quattro e permettono a Kim di ergersi a baluardo quasi insuperabile. Posted in Senza categoria and tagged nazionale femminile under 20 on agosto 17, 2014 by calciocorea. 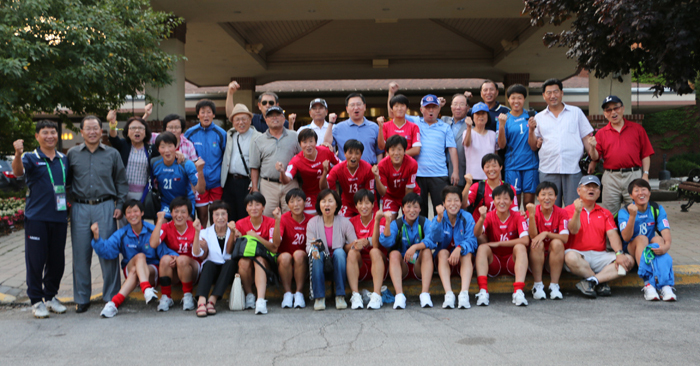 Posted in Senza categoria and tagged nazionale femminile under 20 on agosto 9, 2014 by calciocorea. 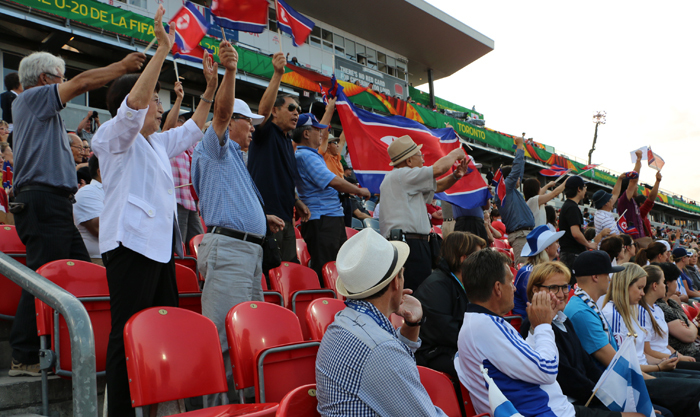 Pyongyang, August 8 (KCNA) — Football fans of the DPRK are very pleased by the news that the DPRK defeated Finland by 2:1 in the first league match of the FIFA U-20 Women’s World Cup 2014. The DPRK girls played a good game in the first match, and it pleases all employees of my workshop. 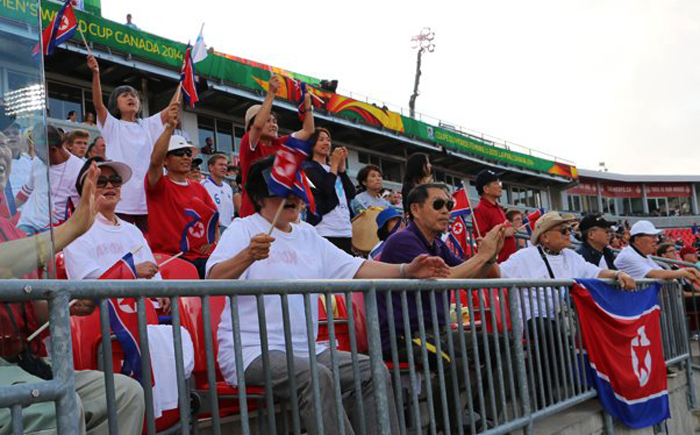 It is praiseworthy that the DPRK girls won the first victory in the U-20 women’s world cup. 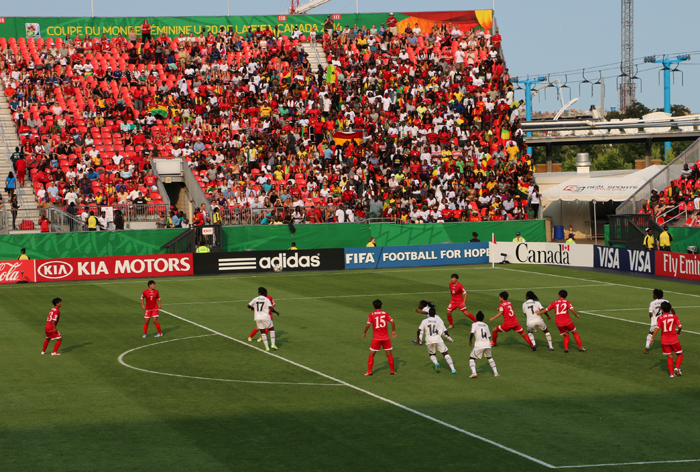 Eight years ago, the DPRK girls took the title in the U-20 Women’s World Cup 2006, thus promoting the country to the first Asian winner of the World Cup. 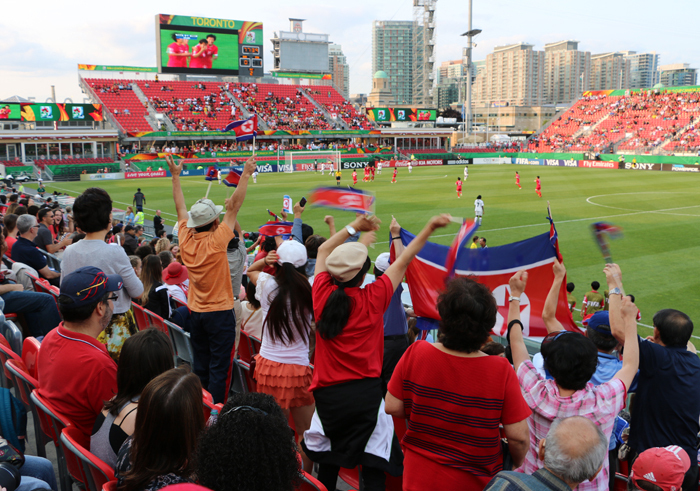 I hope that the DPRK team would prove successful in the matches. 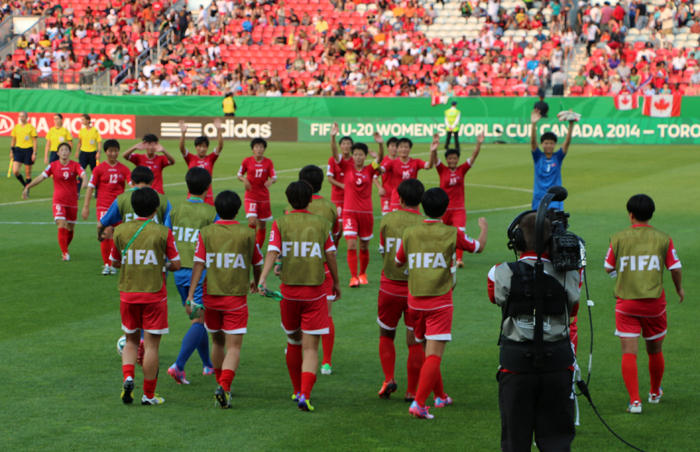 The DPRK team includes 14 players, who played an active role in the U-17 Women’s World Cup 2012. The FIFA website selected Ri Un Sim as one of best players in the current world cup for scoring 8 goals in the six matches of the U-17 Women’s World Cup 2012. March 15th Matches for 9 to 12 place. 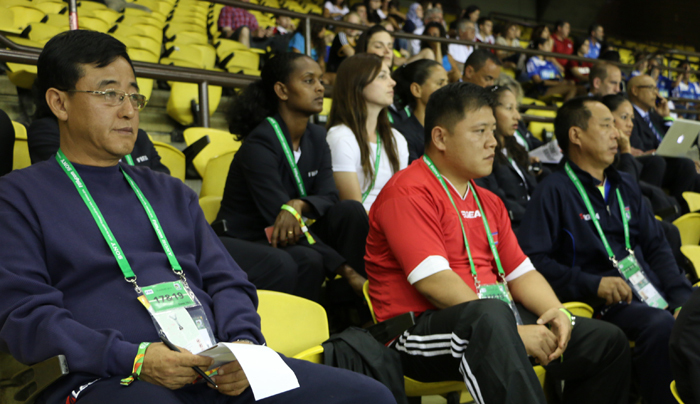 Julia Poznohereva (Ukraine), Eve Gordon (USA), Daria Kravets (Ukraine), Lydia Shpak (Ukraine), King Barabas (Romania), Song Ok Ahn (Korea), Kum Ri Hyang (DPRK) Umran Ozev (Turkey), Natalia Sokolova (Krasnodar region), Maryam Rahimi (Iran), Rachel Ugolik (USA). Posted in Senza categoria and tagged nazionale femminile under 20 on marzo 21, 2013 by calciocorea. Goals: Sarah Marzdashti Gomi, 15 (1-0). Maryam Rahimi, 21 (2-0). Joo Ho Sim, 23 (2-1). Maryam Rahimi, 41 (3-1). Fatemeh Arzangi, 27 (4-1). 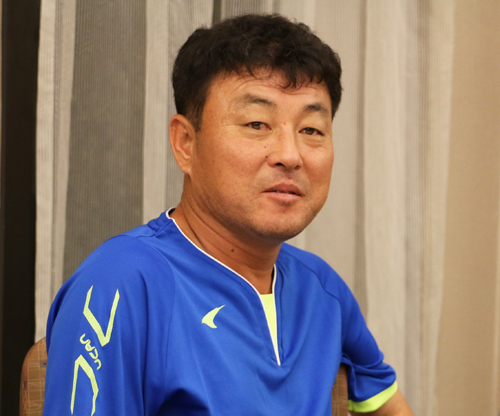 Hang Pu Jie, 62 (4-2). Hang Pu Jie, 73 (4:3). Iran: Zomorod Soleimani, Azar Musavimirkalai, Vahideh ESARO, Maryam Rahimi, Fatemeh Arzangi, Zahra Ganbar Sarah Gomi Marzdashti (Ned Abdollahzadeh, 68), Sarsgin Kamangar, Bayan Mahmoudi (Naragi Tannin, 72), Mahbubeh Yusefpur, Hajar Shahmoradi. DPRK: En Mi Song, Hai Zhong Fu, Hong Ok Rome, Son Mi Ri Song Ok Ahn, Ji Ri Hung, Ho Joo Sim, Hi Jon Ri Kum Hang Pu (Pom Wee Kim, 73), Hang Sim Co., Pom Hang Pu. 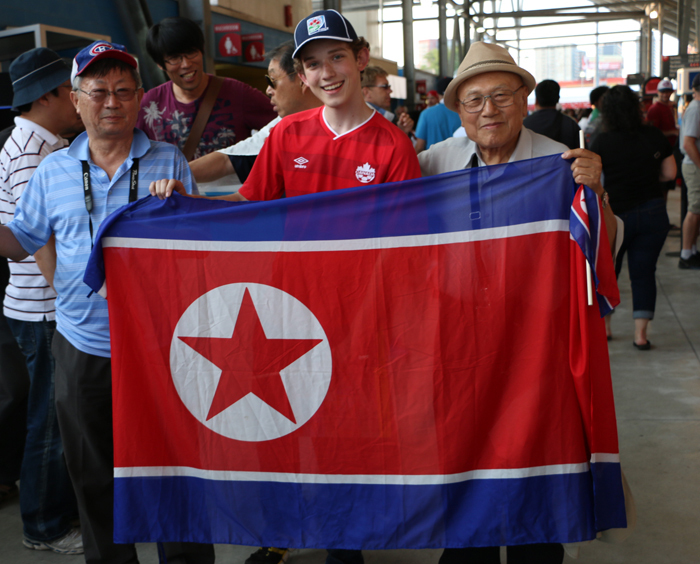 – The match against North Korea was very heavy. 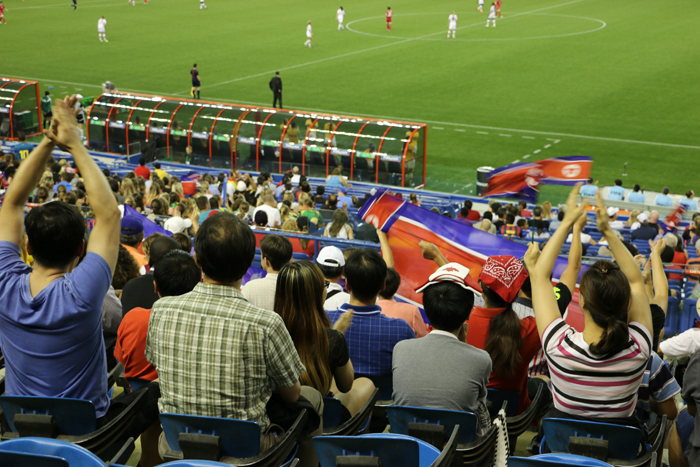 We knew that Korean soccer players are very well prepared technically and tactically. The opponent is very young team. But our team played very well today. 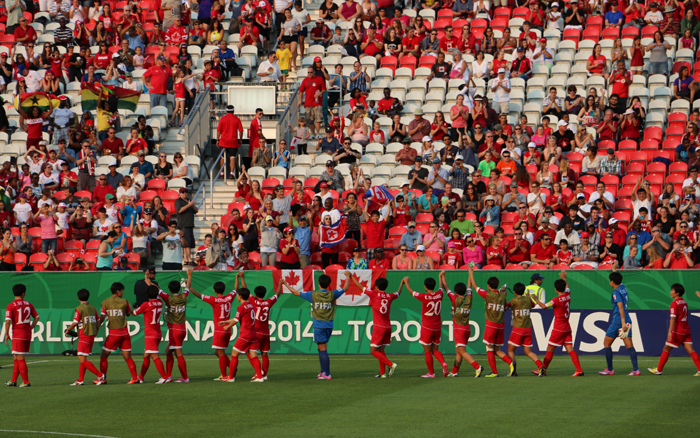 I note that our goal – not only to win, but also to continuously improve their game. Posted in Senza categoria and tagged nazionale femminile under 20 on marzo 10, 2013 by calciocorea. Coreane ancora beffate dagli USA. Eliminazione che brucia ai quarti di finale dei Mondiali under.20 femminili, per la nazionale di Pyongyang, superata ai supplemenatari dagli Stati Uniti. I tempi regolamentari si erano chiusi sull’1-1: vantaggio di Vanessa DI BERNARDO e pareggio di KIM Su Gyong. Nei tempi supplementari decide un gol di Chioma UBOGAGU, con le coreane troppo stanche per cercare il gol del pareggio. Nel complesso, però, una partita equilibrata, decisa da un episodio nel momento clou della sfida. Posted in Senza categoria and tagged nazionale femminile under 20 on settembre 1, 2012 by calciocorea.